Ashley Pharoah is a multi-award-winning writer and creator of shows including Life on Mars, Ashes to Ashes and Wild at Heart. He dropped by our classroom to take questions from our John Yorke Story for Screenwriting students, discussing pitching, his development as a writer and the often long wait from script to screen. Q – Hi Ashley, thanks for joining us! To start, what was the best piece of advice you received from a mentor? Ashley Pharoah – Glad to be here! When I was at the National Film & Television School an amazing writer came over from Los Angeles. He was, in truth, a B-list Hollywood writer, but he was a wonderful teacher. Q – Is there anything that has helped you with your writing that you never expected? AP – That same Hollywood writer introduced me to index cards, and that was such an eye opener. It gives you the ability to just move scenes around without the tyranny of writing – I still use them every day. Q – I’ve never tried index cards. I like the idea that they would free you from the tyranny of writing to start with! AP – You’ll never look back – and then you can use different coloured ones for different characters. Q – How much should you stick to the rules as a beginner? University lecturers often talk about removing prose-like description in scripts, yet when you read scripts by writers like Vince Gilligan, they use this to brilliant effect and it’s hugely engaging. Can you really only break the ‘rules’ once you’ve had some success? AP – I think what you have to do when you’re starting out is write scripts that are ‘easy’ to read. Lean. Quick. Execs are very lazy and look for excuses not to read. That doesn’t have to mean dull, just lean. Q – So, we should make every word count. But that doesn’t mean it can’t have zest as well as functionality? AP – It should absolutely have zest! And personality. I’m talking about avoiding those blocks of solid, dense prose that make an exec turn to someone else’s script. Q – What sort of things did you struggle with as a new writer? AP – When I started out, I was a slightly cowardly writer. I hid behind craft and genre. It took me a long time to be brave and write emotionally – to find my voice. Q – Was there some kind of breakthrough or moment which made you change from writing genre to writing emotionally? AP – It was the death of my mother, to be honest. I just thought that if I had a tiny gift, why spend it writing ‘cool’ genre? I should write about life and death and love and wonder. Q – I have a recognisable ‘voice’ as a writer of children’s books. Is it desirable, or necessary, to have a recognisable voice as a screenwriter? AP – I think it is. Otherwise, why write? With my producer’s hat on, I always want to see original work, not just well-crafted episodes of other people’s shows. It doesn’t have to be perfect, but it does have to be original. I guess the exception is soaps, but even then, you can tell when a good writer is writing. Q – ‘Get those hooks in early’ was what we learned in the last session. Do you place a lot of value in those ticking time-bombs in the opening few pages? AP – Yes, I think that’s sound advice, but you have to hide the bombs well. I have this theory that screenwriting is deferred gratification. Pose lots of questions, but don’t answer them for a long time. Q – On the subject of deferred gratification, Lee Child does this deliberately with his Jack Reacher novels: he poses a question at the beginning and deliberately withholds the answer until the last possible moment. Which scriptwriters would you say are essential for us to learn from? AP – I guess it depends on your own taste and heroes. For me, Dennis Potter was an enormous influence, both thematically and structurally. And he wrote about ‘place’ so wonderfully. Q – For novelists, there’s a phenomenon called ‘second-book nerves’. Is this a familiar problem for you as a scriptwriter, or for screenwriters you know? AP – I don’t think screenwriters have that luxury! We are in a much more industrial beast than novelists, and that beast needs to be fed. Production deadlines tend to frighten away any nerves. Q – I was wondering, with Life on Mars and Ashes to Ashes, how you approached the balance between crafting something familiar that would have an audience, and making something that people hadn’t seen before? AP – I think we had the advantage of genre. Both of them were cop shows with clear statements of work, so the audience had that comfort. Then we could start to play with them! But it was a huge fight to get Life on Mars made – eight years from idea to screen. Broadcasters were very anxious about it as a concept. Q – Well, I’m glad they said yes! Mad Men and Breaking Bad had similar waits didn’t they? AP – Yes, I think so. Sometimes the world isn’t ready. I’m not sure we’d get Life on Mars made now, or at least not on BBC1. Q – How did you assuage those broadcasters’ fears? AP – I’m not sure we ever did. Younger execs took over and high concept stuff was starting to bleed over from the States. Doctor Who was rebooted. I think the wheel just turned from social realism to high concept and we jumped in! John Yorke was a huge part of that journey. Q – The ending to Ashes to Ashes really stayed with me. It struck me at the time as a brave direction to commit to and it worked so well with a big emotional hit. Did you always have that ending in mind? AP – No, we didn’t. We thought we would do three series of Life on Mars and that would be it, but the BBC asked us to keep it going. 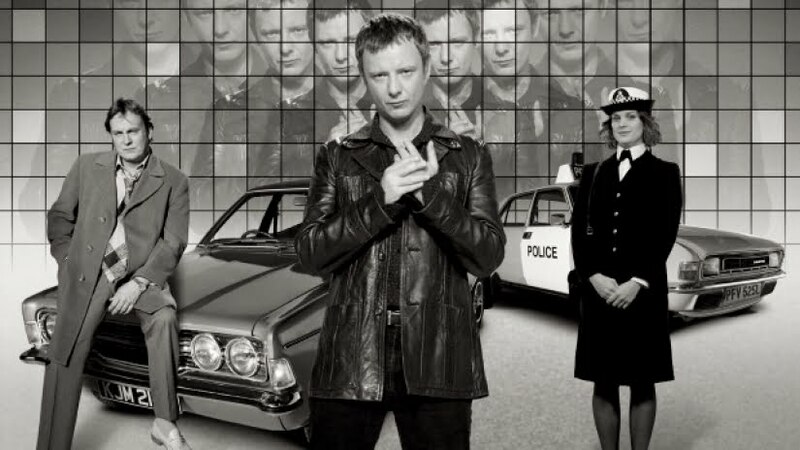 Only when we were writing Ashes to Ashes did we start to realise that Gene was some sort of cop angel, helping the purgatory coppers to Heaven – which turned out to be a pub! Q – Then it’s impressive how congruently the end fitted in with everything that had come before! Do you ever spend time writing or developing stories from entirely different genres? Is there any advantage to that, or is it easier for you to have a singular focus when working on one project? AP – That’s kind. Thank you! I always have lots of projects on and I love that they’re from different genres. It keeps me fresh and frightened and on my toes. Q – Do you think there are any recurring themes that appear in all of your work regardless of format or genre? AP – I think I’ve written a lot about ‘home’. And perhaps of finding Your Place In The World. It was never conscious, but it links a lot of my work, I think. Q – Do you have good tips for how to pitch your story to a broadcaster? If you have, say, four minutes, what would you emphasise? AP – I hate pitching, but it’s a necessary evil. I liked my pitch for Wild at Heart – a fucked-up British family goes to Africa to manage a run-down game park and try and find themselves. Increasingly, it seems to help to highlight a big central character that might attract a big actor. And don’t forget tone – I think it’s important to give a sense of the texture of your show. Dark? Funny? Sad? Melancholic? Crazy? Q – I’ve been noticing tone so much recently. Do you think it should be based upon the personality of the protagonist, or should it be part of a message or theme? AP – A bit of both, probably. I was just watching Derry Girls and the tone is so brilliant and confident and original. Q – Do you think it should bleed through everything? Dialogue, locations, personalities, and what happens? AP – Yes, I think it should. It should saturate everything. And if it’s in the script the others will pick up on it – design, lighting, costume. And that’s when you might have something special on your hands. There was a series on recently – Requiem – and it was really good in parts, but it felt like it didn’t quite know what it was and the tone wobbled. We’ve all been there. Q – With it taking eight years for Life on Mars to get to screen, what was it that kept you pushing through that period to get it made? Did you know it had something special about it? AP – I honestly think because there were three of us writers who created it, and we’d get together and laugh about how Gene Hunt would deal with a crime. I think if it had been just me I would have thrown the towel in. Q – It’s great that you were all able to keep going with it, and must have been very satisfying to see it finally made. AP – Incredibly satisfying. Some very important people told us it was a bad idea. Revenge was ours. Q – How do three writers get along working on the same script? Any recipe for how to collaborate? AP – Well, I started on EastEnders and collaboration was part of the job. I loved being with other writers, listening and learning. My favourite part of the process is probably the writers’ room, but there has to be a level of trust and kindness and admiration. Q – I’m hugely enjoying Life On Mars right now. My husband, who’s an architect, was noticing all kinds of things about the police station design that subliminally suggests the world is awry. AP – How clever of him! That was our director’s idea, that none of the lines of lights ran true. Very few people notice it. Q – This has been fascinating and incredibly useful. Thanks so much for speaking with us, Ashley! AP – I may have written Life on Mars, but I also wrote Bonekickers, so take everything I say with a pinch of salt! Thank you for having me, and good luck. Born in 1959 in Somerset, Ashley Pharoah is an award-winning writer and series creator. His credits include Life on Mars, Ashes to Ashes and The Living and the Dead. Follow the link to visit his agency profile. Learn more about our Storytelling for Screen online course. Applications open now. Discover more about all our courses here.